Bryant Awarded Fulbright Grant to Germany Carson Bryant '18 has been awarded a Fulbright grant for an English Teaching Assistantship in Germany. Washington and Lee University senior Carson Bryant has been awarded a Fulbright grant for an English Teaching Assistantship in Germany. Bryant has been studying German since high school, and prior to college lived with a German family for two weeks. 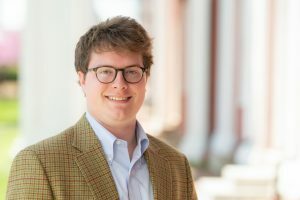 During his time at W&L, the German and economics double major has participated in the Real Estate Society, DAAD Young Ambassadors Program, is a work-study at the Outing Club barn, and is a member of the Arts League, German club and Sigma Nu fraternity. During his time in Germany, Bryant hopes to establish a club for students interested in learning English and plans to hold extracurricular events to promote learning through experience and engagement. “This type of club has been valuable to me in learning German and could be similarly beneficial to German students learning English,” he said.